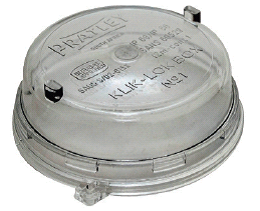 KLIK-LOK Junction Boxes For Electrical Housing Applications. – Available in 2 sizes. – 5-Way box with 4 side entries: 2 side entries blanked off with plugs, 2 open side entries & 1 drillable bottom entry. – Black or transparent lid. – “Click Lock” lid design. – Impact resistant and corrosion free. – Boxes supplied without cable glands. 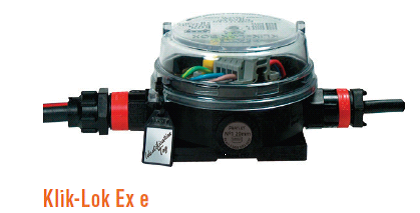 – Optional Ex e II T6, Ex tD A21 IECEx approved versions. Maximum no. of terminals that can be fitted on rail (including end plates and end stops). PR57284 No. 1 box size, 119.5 x 86.5mm, black lid, 99 x 66mm usable space, M20 x 1.5mm cable entry, 0.33kg. PR57285 No. 1 box size, 119.5 x 86.5mm, transparent lid, 99 x 66mm usable space, M20 x 1.5mm cable entry, 0.33kg. PR57286 No. 2 box size, 149.0 x 110.5mm, black lid, 120 x 89mm usable space, M25 x 1.5mm cable entry, 0.55kg. PR57287 No. 2 box size, 149.0 x 110.5mm, transparent lid, 120 x 89mm usable space, M25 x 1.5mm cable entry, 0.55kg. PR57292 No. 1, Blanking plugs M20. PR57293 No. 2, blanking plugs M25. PR57290 N0. 2, Reducing locknut 25 to 16mm. PR57291 No. 2, Reducing locknut 25 to 20mm. 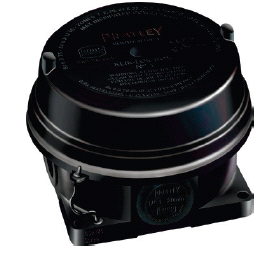 *Boxes are designed to be fitted with Pratley cable glands.